Three 2019 Harley-Davidson® CVO™ models offer show-stopping finishes, advanced technology, exclusive components and attention to detail that borders on obsessive. The Harley-Davidson Custom Vehicle Operations™ program creates limited-production Harley-Davidson motorcycle models for the most-discerning customers, often using finishes, materials and accessories that are only available on a CVO model. Black Onyx is a finish featured on the exhaust of the darkest styling treatments offered for CVORoad Glide and CVO Street Glide models. This “physical vapor deposition” finish is applied over chrome. The finish was originally developed for mil-spec and jewelry applications. It’s very durable but also so thin that in bright light the underlying chrome is visible through the Black Onyx finish. 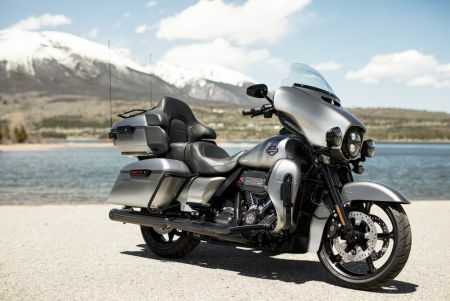 NEW Boom!™ Box GTS infotainment system is standard on each 2019 CVO™ model. The Milwaukee-Eight® 117 is exclusive to CVO models and features 117 cubic inch displacement, a high-performance camshaft and intake, an elevated 10.2:1 compression ratio and produces up to 125 ft. lbs. of torque. On 2019 models the Milwaukee-Eight 117 for CVO is identified by a bright Blaze Red band on the engine rocker boxes. CVO Street Glide: Six Boom!™ Stage II bi-amped speakers (paired in the fairing, lowers and saddlebag lids) with 150 watts per channel from three separate 300 watt amplifiers for 900 watts total power – the most outrageous factory-installed Harley-Davidson audio system designed to surround the rider in rich, clear sound. CVO Limited: Four Boom!™ Stage I speakers (paired in fairing and Tour-Pak® carrier) powered by a single amplifier and 75 watts per channel. CVORoad Glide: Four Boom!™ Stage II bi-amped speakers (paired in fairing and saddlebag lids) with 150 watts of power per channel from two separate 300 watt amplifiers for 600 watts total power.